Olive cultivation on Montello goes a long way back in time; in fact, there were olive groves around the abbey of Saint Eustace. However, various historical events in the area led to the gradual demise of the olive cultivation, taken over by wild woods. 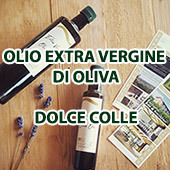 In recent years people have started to bring olive cultivation back to the area, both to reduce food miles and also because the oil from the Treviso hills is particularly appreciated on the market. Olive trees are planted on the Southern side which is sunnier and has a Mediterranean climate. Like many other land products, the flavour, colour and scent vary according to the area of cultivation. The oil of Montello is made from small olives. It is rich in oleic acid and has a delicate and slightly spicy flavour. It goes well with all kinds of food and it can also be eaten raw on a slice of bread.